The Frigid Foreman Mouse is an Event Mouse found during the annual Great Winter Hunt event. Catching this mouse will provide you with extra Tower Slabs that you can use to build your own, competing tower. Information on how to locate and capture the Frigid Foreman Mouse can be found on the current Great Winter Hunt location page. Attraction: Only while the Ice Tower is not upgraded and once the Week 3 Ice Tower is completed. 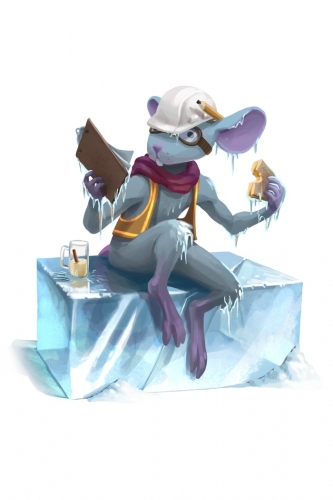 9 December 2014: The Frigid Foreman Mouse was introduced as part of the Great Winter Hunt 2014 event. 13 December 2016: The points/gold for Frigid Foreman Mouse were changed.